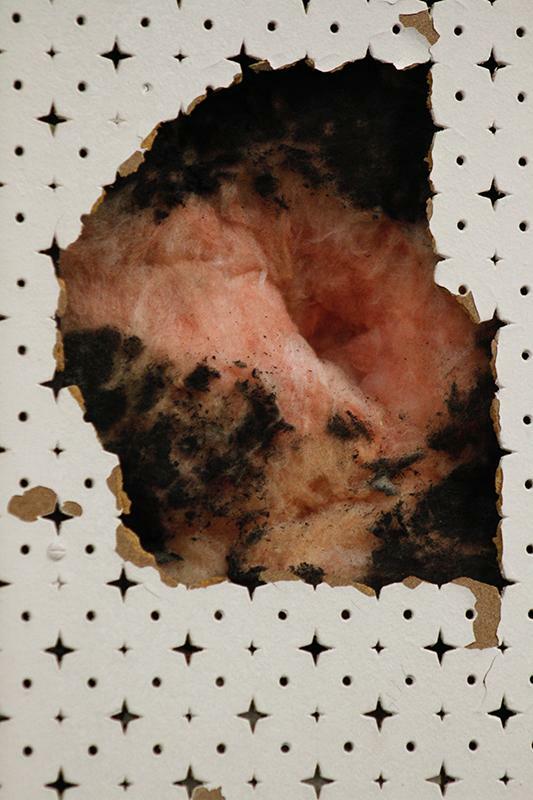 While black mold doesn’t pose the immediate risks that situations like burst water pipes or damaged electrical wiring do, few maintenance situations get the immediate priority response that the mere mention of black mold demands. Recently, Bakersfield College students became concerned regarding what appeared to them to be a black mold issue in the Forums. Some of the acoustic tiling on the wall has fallen away as a result of aging material, and visible behind the face of the tile is a lumpy black mass of stuff that students were at a loss to identify. When informed of the black mass, Maintenance and Operations director Don Birdwell dispatched staff to check it out. A second check in the area confirmed there is no black mold in the Forum classrooms. Birdwell said the black substance students may see behind damaged or removed acoustic tiling in the campus buildings is actually the insulation that separates acoustic tiling from other kinds of drop or adhesive tiles. It is the insulation that absorbs sounds and cancels echoes, and it can be found anywhere where large groups of people are intended to gather to listen to presentations, including lecture halls on college campuses. Birdwell explained that it’s the same sort of insulation that can be found inside the walls of any house, and students are absolutely safe around it. The reason it’s black instead of the familiar pink or yellow most people associate with building insulation is because it is painted. If it were left pink or yellow, explained Birdwell, the bright color would be visible through the holes in the face of the tile. Students wanting to report possible maintenance situations may visit the M&O department office in the front of the Levinson Building (located behind the BC bookstore parking lot). Students can also call the facilities staff at 395-4221 (x4221 from campus telephones), or visit www.bakersfieldcollege.edu/maintenance and follow the links to create a maintenance work order online.